HED International, Inc., a leader in the design and manufacture of casting/coating equipment for the production of thin and thick films, today announced that a state-of- the-art caster/coater has been shipped and installed at a major US based supplier of advanced electronics. Valued at a half a million dollars, this unit was custom designed to meet the exacting requirements of the customer’s product. “Superior engineering, manufacturing and customer service are the keywords of our company. We work with our customers to provide equipment which will put them ahead in their field,” stated Katleen Kriskewic, Pro-Cast Division Sales Manager at HED International, Inc.
HED International offers a full line of versatile PRO-CAST® Series Casting/Coating Machines for the production of high quality cast/coated products. Systems range in length from 12 feet, ideal for lab scale applications, to over 100 feet for production models. They are available with a variety of casting surfaces, casting heads and carriers, and designed for batch or continuous production of flexible films. 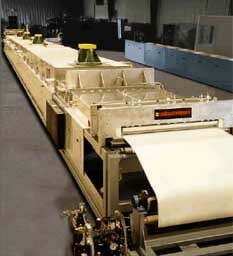 “Green” tape thicknesses from less than 0.001″ to 0.125″, and tape widths from 4″ to 52″, are routinely produced on the PRO-CAST® machines. The PRO-CAST® Series are “production proven”, having set performance standards in the production of millions of square inches of product. All are equipped with continuous conveyor systems with surfaces that assure imperfection-free castings/coatings. Production variables, such as conveyor speed, temperature profile, solvent gradient, and air flow, are adjusted and controlled precisely.